‘DAKINI’ (Sanskrit): the female embodiment of enlightened energy. 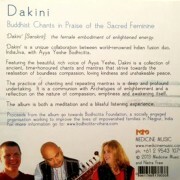 ‘Dakini’ is a unique collaboration between world-renowned Indian fusion duo, IndiaJiva, with Ayya Yeshe Bodhicitta. 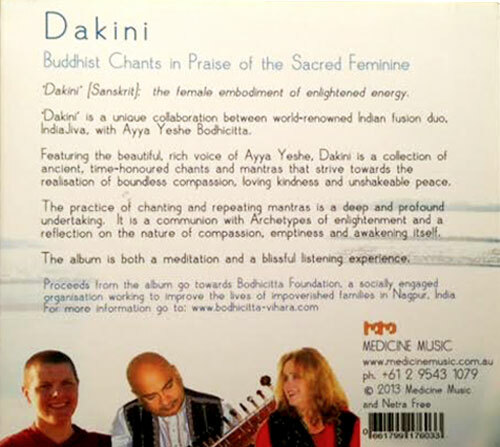 Featuring the beautiful, rich voice of Ayya Yeshe, Dakini is a collection of ancient, time-honoured chants and mantras that strive towards the realisation of boundless compassion, loving kindness and unshakeable peace. The practice of chanting and repeating mantras is a deep and profound undertaking. 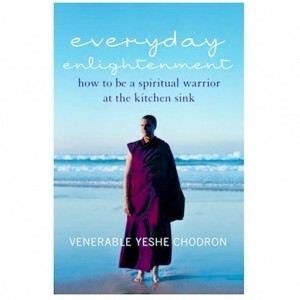 It is a communion with Archetypes of enlightenment and a reflection on the nature of compassion, emptiness and awakening itself. The album is both a meditation and a blissful listening experience. Sample song: Chod Click here to listen on Youtube.